A close up of the Sydenham as it rushed past our campsite. Great music for sleeping. Photo by Kathy White. Earlier this summer, Doug and I treated ourselves to a camping and hiking trip in Owen Sound, ON. 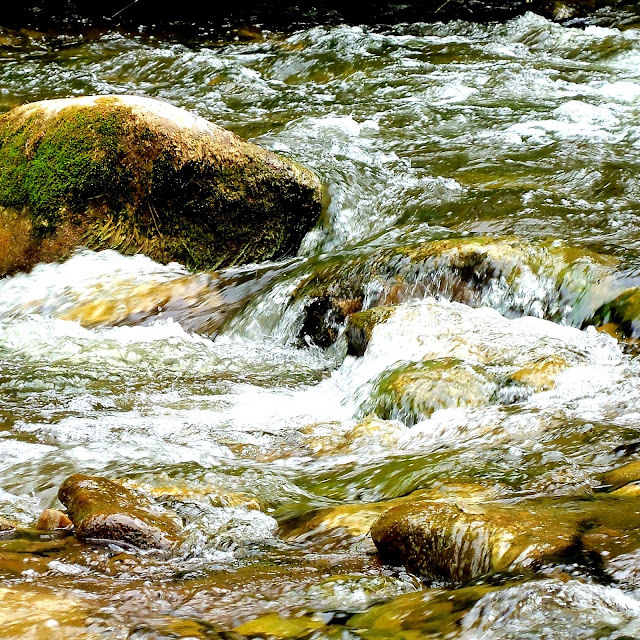 It sounds odd to camp in a city but Harrison Park feels like a secret world, tucked into a tall, green forest and bordered by the Sydenham River. Hiking trails lead directly out of the campground and you can clamber over mossy rocks and little streams, all the way to Inglis Falls. I haven't camped in awhile and I was surprised at the feeling of coming home that it gave me. Have you ever experienced that feeling - almost like remembering who you are? The scenery made for some great, 'classic Ontario' photos and I came home motivated to do a series that pays tribute to this area. The photo above is my inspiration for the first piece, already in the works. I love the way you can trace the flow of the river in this composition. 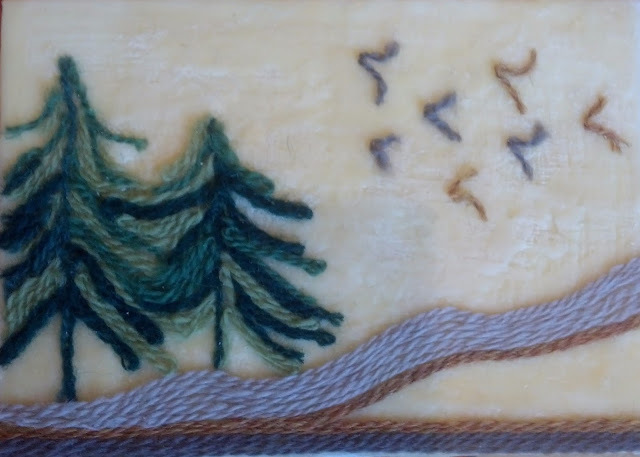 Winter Meadow, Peruvian Wool and Beeswax on Birch Panel, 9" x 12" x 1.5"
I finally finished 'Winter Meadow', which has been my 'in between' project over the winter, spring and summer. 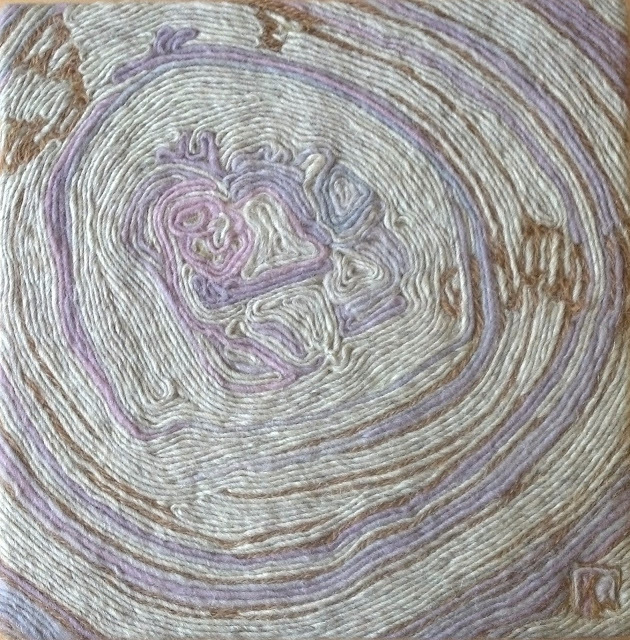 If any of you came by my exhibition at the St. Jacobs Quilt and Fibre Art Festival, this was the piece I was working on. Thank you to the many people I consulted about sky colour. You were right - the grey does show off the brighter grasses in the foreground. 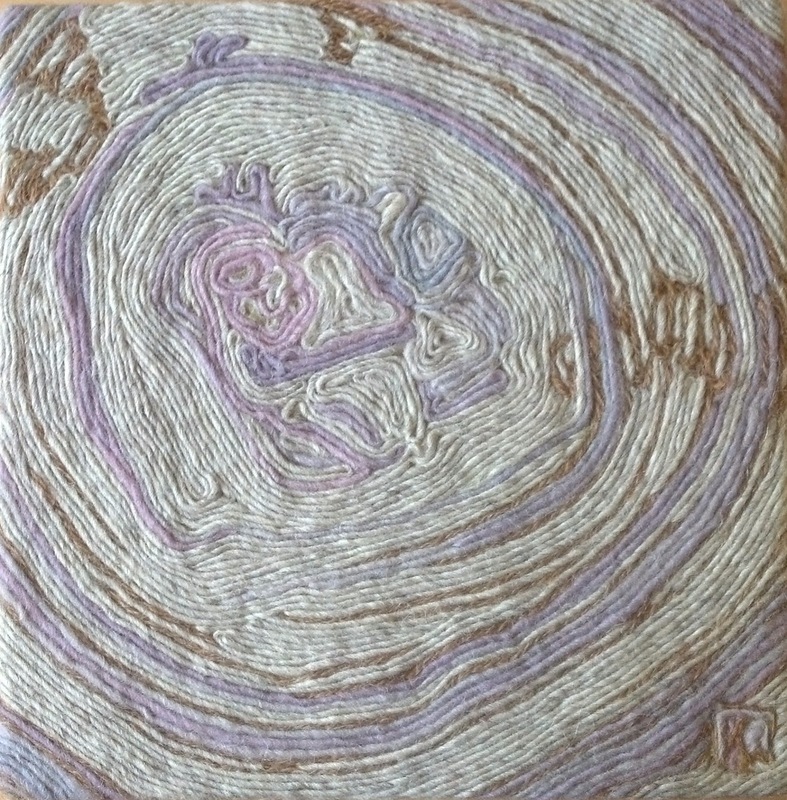 Pebble, Aran Weight Wool and Beeswax on Birch Panel, 8" x 8" x 1.5"
Commissioned pieces force me to try something new. 'Pebble' was done by request and I had a lot of fun with it. Whenever we travel to a place I connect with (like Harrison Park), I bring home a small pebble to add to a collection that lives in my yoga space. Over time, I forget where each one is from and they become interesting objects in their variety and individuality. One of those pebbles was the model for 'Pebble'. Betty's workshop piece in progress. I love the colours and the birds! 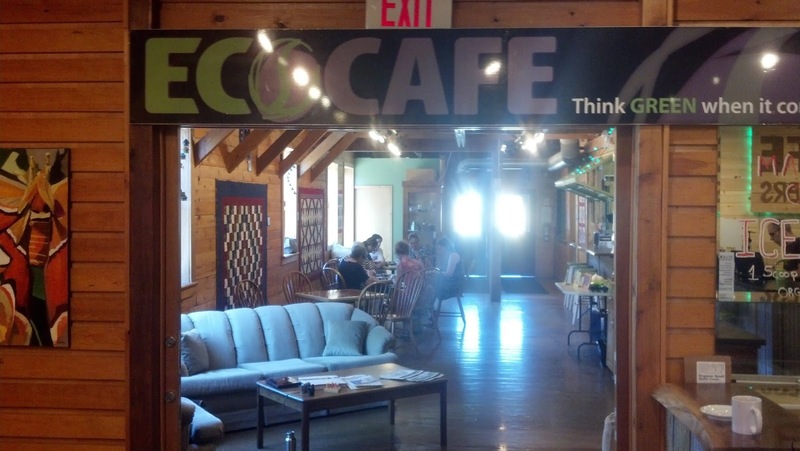 Finally, we had another great group show up for our July workshop at the EcoCafe in St. Jacobs. I've said it before and it holds true - fibre people are good people. I witness so many acts of kindness between strangers when I hover on the edges while people work on their pieces. Thanks to everyone who participated and, again, I'd love to see your finished pieces! 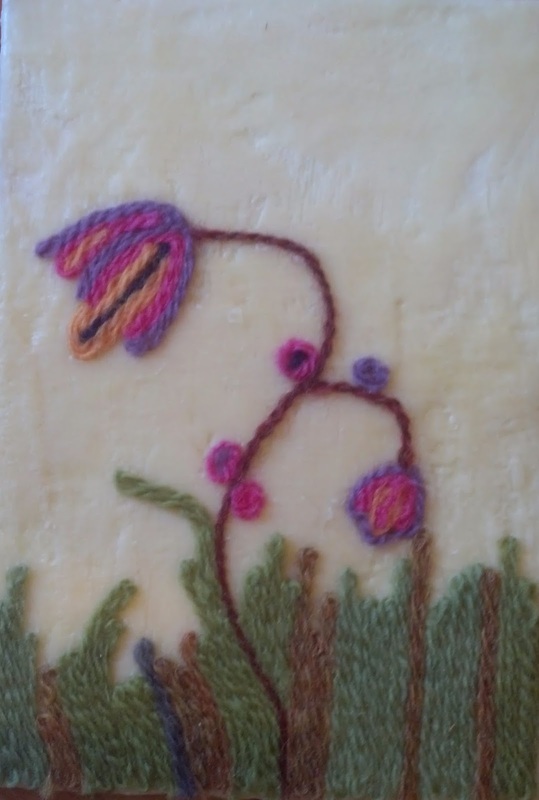 What a great setting for a fibre art workshop! Special thanks to the very accommodating people at the EcoCafe for generously allowing us to use their gorgeous space for our workshop and also for the free refills! The cafe was a cool refuge on a hot day and kept us fueled with yummy treats. Thanks as well to the Silo Weavers for getting word out about the workshop, handling registration, and for all of the ongoing, fantastic support. Helene's pretty workshop piece in progress. It's been a hot summer here and I'm starting to long for cooler autumn weather with cozy hand-knit sweaters. But not right away. Give me just a little more time for Frisbee and barbecues, early morning sunshine, and afternoons too hot to do anything except find a cool spot to stretch out and read a very good book. Agnieszka's workshop piece in progress. 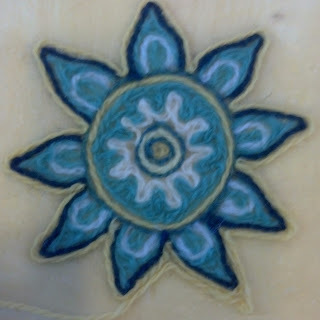 The first mandala!